Vatican Museums and Galleria Borghese will appeal to museum buffs. Your cultural itinerary includes sights like Palatine Hill and Piazza Navona. And it doesn't end there: steep yourself in history at Colosseum, pause for some serene contemplation at St. Peter's Basilica, admire the masterpieces at Musei Capitolini, and stroll the grounds of Catacombe di San Callisto. To find ratings and tourist information, read Rome travel itinerary planner. Atlanta, USA to Rome is an approximately 13-hour flight. You can also do a combination of flight and train. You'll lose 6 hours traveling from Atlanta to Rome due to the time zone difference. Traveling from Atlanta in June, plan for little chillier nights in Rome, with lows around 65°F. Wrap up your sightseeing on the 14th (Fri) early enough to travel to Sorrento. Your day-by-day itinerary now includes Pompeii Archaeological Park. On the 15th (Sat), you'll have a packed day of sightseeing: don't miss a visit to Piazza Tasso, explore the ancient world of Pompeii Archaeological Park, then tour the pleasant surroundings at Bagni d'Arienzo, then kick back and relax at Fornillo, and finally view the masterpieces at Art & Craft Gallery. 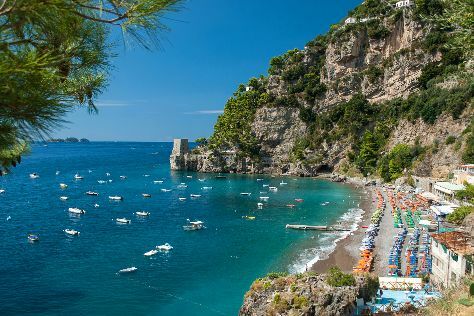 To see maps, more things to do, traveler tips, and other tourist information, you can read our Sorrento online route planner . Traveling by combination of train and subway from Rome to Sorrento takes 3 hours. Alternatively, you can drive; or take a bus. In June, plan for daily highs up to 82°F, and evening lows to 68°F. You will leave for Florence on the 16th (Sun). Kick off your visit on the 17th (Mon): enjoy the sand and surf at Lido Di Camaiore, then appreciate the extensive heritage of Piazza del Duomo, and then identify plant and animal life at Wildlife Areas. 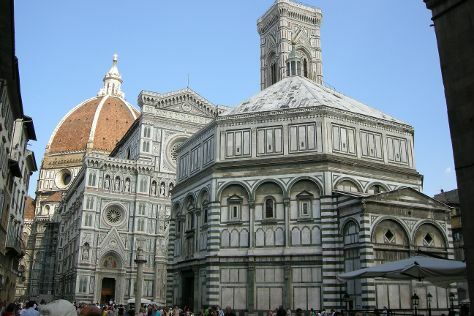 Here are some ideas for day two: take in the spiritual surroundings of Cathedral of Santa Maria del Fiore, admire the masterpieces at Uffizi Galleries, then see the interesting displays at Pitti Palace, and finally examine the collection at Academy Of Florence Art Gallery. To find more things to do, other places to visit, ratings, and more tourist information, refer to the Florence day trip app . Do a combination of subway and train from Sorrento to Florence in 4.5 hours. Alternatively, you can drive; or do a combination of subway, train, and flight. In June, plan for daily highs up to 83°F, and evening lows to 65°F. Finish up your sightseeing early on the 19th (Wed) so you can catch the train to Venice. Start off your visit on the 19th (Wed): kick back and relax at Bagni Alberoni, explore the galleries of Peggy Guggenheim Collection, then take a stroll through Campo del Ghetto, and finally take a stroll through Cannaregio. Get ready for a full day of sightseeing on the 20th (Thu): take a stroll through Campo San Toma, then admire the striking features of Basilica di San Marco, then browse the exhibits of Doge's Palace, and finally appreciate the extensive heritage of St. Mark's Square. To see ratings and more tourist information, refer to the Venice trip itinerary maker website . Getting from Florence to Venice by train takes about 2.5 hours. Other options: drive; or take a bus. In June, plan for daily highs up to 81°F, and evening lows to 63°F. Wrap up your sightseeing by early afternoon on the 21st (Fri) to allow enough time to take a train to Milan. On the 22nd (Sat), play a few rounds at Golf Club Matterhorn, take in the architecture and atmosphere at Intercontinental Church Society, explore the different monuments and memorials at Mountaineers' Cemetery, take in the architecture and atmosphere at St. Mauritius Church Zermatt, then make a trip to Matterhorn Museum - Zermatlantis, and finally make a trip to Kapelle Winkelmatten "Zur Heiligen Familie". For reviews, where to stay, maps, and tourist information, use the Zermatt trip itinerary planner . Traveling by train from Venice to Zermatt takes 7 hours. Alternatively, you can do a combination of flight and train; or do a combination of shuttle, bus, and train. Finish your sightseeing early on the 23rd (Sun) so you can take a train to Montreux. Kapelle Winkelmatten "Zur Heiligen Familie"
Mostly known for its world-renowned jazz festival, Montreux serves as a picturesque lakeside resort town on the Swiss Riviera. Kick off your visit on the 23rd (Sun): identify plant and animal life at Corniche Lavaux Vineyards, then do a tasting at Terres de Lavaux, then have fun and explore at Chaplin's World, and finally admire the striking features of Chateau de Chillon. Get ready for a full day of sightseeing on the next day: tee off at Franck Ollivier Golf Pro, admire the striking features of Cathedrale de Lausanne, and then examine the collection at Olympic Museum Lausanne (Musee Olympique). To find photos, where to stay, reviews, and other tourist information, go to the Montreux trip maker site . Take a train from Zermatt to Montreux in 3 hours. Wrap up your sightseeing on the 25th (Tue) early enough to drive to Lucerne. Kick off your visit on the 25th (Tue): kick back and relax at Ufschotti Park, then contemplate in the serene atmosphere at Hofkirche, then take your sightseeing to a higher altitude at Mt Pilatus, and finally pause for some serene contemplation at Jesuitenkirche. Get ready for a full day of sightseeing on the next day: contemplate the waterfront views at Lake Lucerne, look and learn at Swiss Museum of Transport, and then steep yourself in history at Museggmauer. To find other places to visit, ratings, maps, and tourist information, go to the Lucerne trip itinerary planner. Traveling by car from Montreux to Lucerne takes 2 hours. Alternatively, you can take a train; or do a combination of train and flight. Expect a daytime high around 74°F in June, and nighttime lows around 56°F. Finish your sightseeing early on the 27th (Thu) to allow enough time to travel to Paris. Visit Cathédrale Notre-Dame de Paris and Eiffel Tower for their historical value. Your cultural itinerary includes sights like Palace of Versailles and Louvre Museum. And it doesn't end there: pause for some serene contemplation at Basilique du Sacre-Coeur de Montmartre, admire the landmark architecture of Centre National d'Art et de Culture George Pompidou, contemplate the long history of Sainte-Chapelle, and pause for some photo ops at Arc de Triomphe. For other places to visit, ratings, photos, and tourist information, you can read our Paris visit planner. You can do a combination of train, bus, and flight from Lucerne to Paris in 4.5 hours. Other options are to do a combination of train and flight; or drive. In June in Paris, expect temperatures between 74°F during the day and 55°F at night. You will have some time to spend on the 1st (Mon) before leaving for home.